Garage Door Repair in Houston | Same Day Service - No Extra Charge! Need Garage Door Repair Fast? We offer 24 hours service! Mechanical failure is a common problem with overhead garage doors, especially if the overhead door and automatic opener are not regularly maintained. Whether from lack of maintenance, improper installations, aging equipment, or damage from a vehicle or other contact, our trained, experienced garage door repair technicians can get your door working quickly and safely. 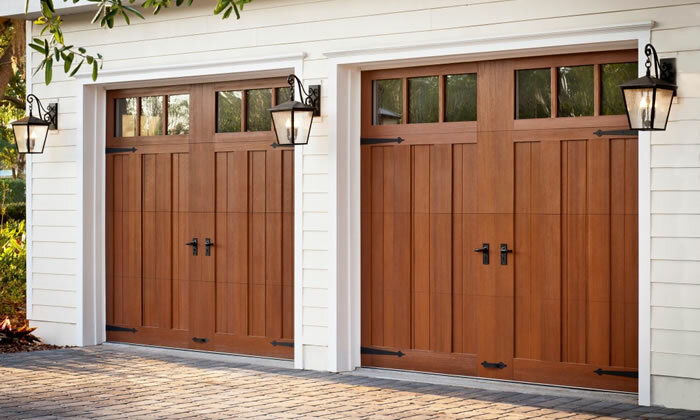 Aladdin Garage Doors Houston is a full-service garage door company specializing in repair and installation of garage door systems as well as tune-ups and maintenance to help you minimize the need for door or opener repairs. From a simple door track repair to replacing a spring or even replacing your entire old, weathered garage door with a new, modern upgrade, our technicians can guide you on the best choices and offer free estimates. Why Choose Aladdin Garage Doors? We can get your garage door back in working order any time day or night. We offer guaranteed same-day service for calls before 2 p.m. at no additional charge. 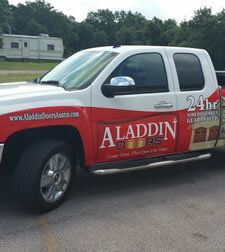 When you choose Aladdin Garage Doors Houston, you are putting your trust in a family-run business that specializes in repairing and installing garage and overhead door systems. Being a local family business, we want our customers to be 110% satisfied with our services. Whether you’ve had a torsion spring break, your door has come off its track, or your door needs frequent service, the team at Aladdin Garage Doors is ready to provide you with service right now.